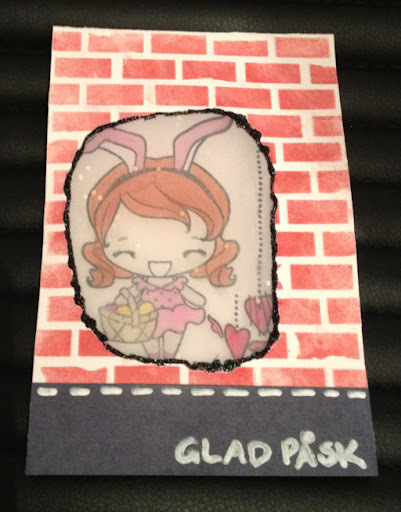 I started by stamping Easter Anya on a vellum sheet, and then the hearts from Glimmer Bean on the side (img). Then I painted it, and cut it out. However, the transfer didn't work, it just melted the candle. So I thought I'd do it the regular way with a napkin. 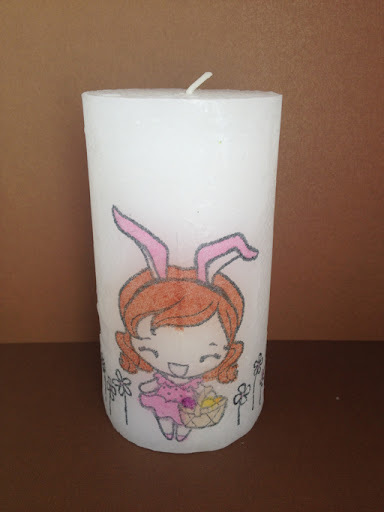 I stamped Anya again, and then the flowers from Sitting lovely to sitt on the bottom of the candle. I then painted it with Pro Markers just like I painted the first one. 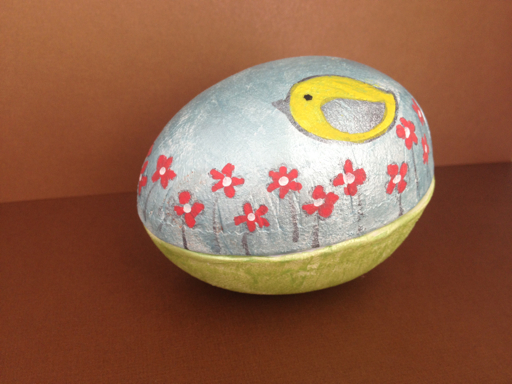 I also wanted to decorate an Easter egg that you fill with candy. It was craft brown, so I used gesso to get it white. 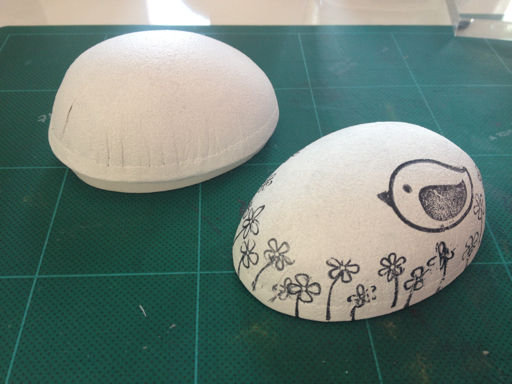 Then I stamped the same flowers round the border with black StazOn, and a bird from the Sunshine kit on the top. 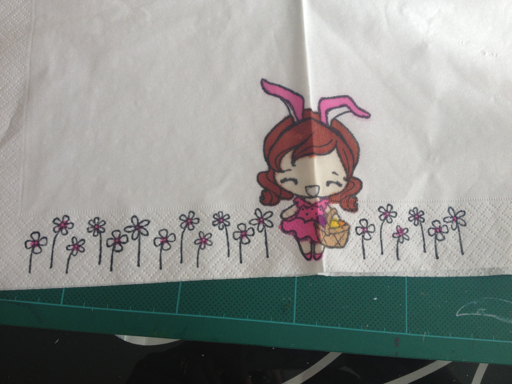 It was hard to get the imprint of the flowers nice, but that will sort it self out when I paint it. I started with painting the top and bottom with blue and green acrylic paint, and let it dry. Then I painted the petals with a red Posca pen, and put a white dot in the middle of them. The bird was painted with a yellow Posca, and a black dot for the eye. Well, so what to do with the vellum Anya?! 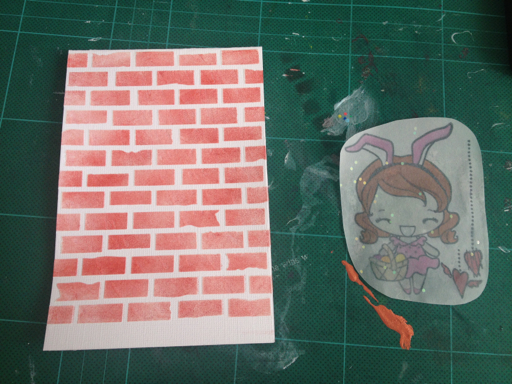 I made a brick wall by using Modeling paste on a brick templete, let it dry, and then used Distress ink Fired brick on it. 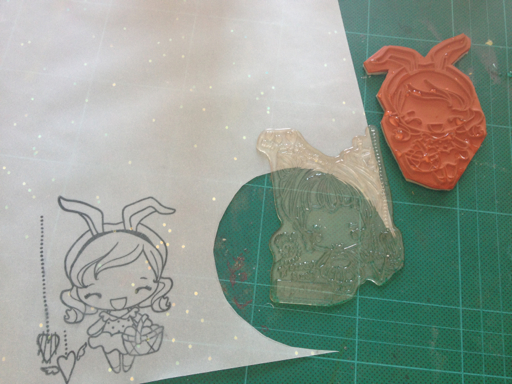 Since the vellum is transparent, adding it to the front makes her look like a ghost... So I made an aperture, and lined it with black Stickles. Finally I wrote a greeting on a dark gray scrap and put it at the bottom of the card.